"The first book in a scifi retelling of the Mahabrahata. When Esmae wins a contest of skill, she sets off events that trigger an inevitable and unwinnable war that pits her against the family she would give anything to return to. Inspired by the Mahabharata and other ancient Indian stories, A Spark of White Fire is a lush, sweeping space opera about family, curses, and the endless battle between jealousy and love." I've been trying to share my thoughts on this astonishing book for some time now, but the last month has been overwhelming, to say the least. Now that I finally found the opportunity, get ready for many incoherent sentences and fangirling (fine, I'll restrain myself) because A Spark of White Fire stole my heart. 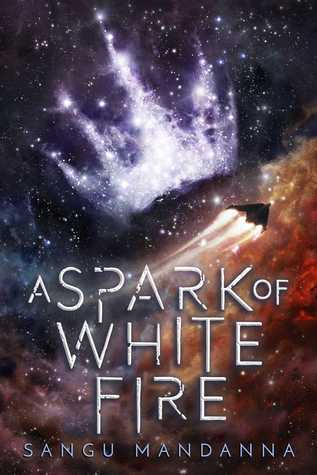 Writing: A Spark of White Fire is a beautifully written space opera. The plot is fast-paced, the prose is captivating, the descriptions are breathtaking. I fell in love with these galaxies sprinkled with a thousand stars and floating cities. Through the combination of curses, family rivalry, political intrigue (this was refreshing since there wasn't the dichotomy good/bad side), mythical gods and goddesses, sentient spaceships and fate, Mandanna weaves a narrative that sweeps you off your feet. Characters: After being cursed and abandoned, Esmae wishes to reconnect with her twin brother, Alexi, and help him get back to the throne stolen by their uncle. She doesn't fear going against the gods, who love playing favourites, in order to do it, even if it means putting herself in harm's way. However, when she realizes her uncle is not the evildoer she thought him to be, Esmae will do whatever she can to stop a war, which might kill thousands of innocents, from break. "Your arrow was a spark,” she replies, “A spark of fire so hot and white that no one will be able to put it out. And even a spark of fire can consume an entire forest if it can jump from tree to tree. Watch, Esmae. Watch as one act leads to another and then to another after that. Watch the trees pass white flames on. Watch the forest burn." Esmae is everything I could ask for in a main character. I loved how she was compassionate and fierce; how she fights to bring peace to the kingdom she calls home; how she didn't allow years of resentment cloud her judgment (Esmae and Max, I'll go down with this ship; have I ever told you how much I adore a hate-to-love relationship? ); how she is a true warrior at heart! Also, every single character brought something into the story: Rama's goofiness and loyalty; Max's secretiveness; Alexi's pride; Titania's, a war sentient spaceship, protectiveness. They all played a part in the story. World building: A Spark of White Fire is a sci-fi retelling of the Mahabharata, a Sanskrit epic that narrates the tale of the Kaurava and the Pandava princes, set in the deep space. I can't lie: I know little bits of Indian mythology, but my knowledge of Indian folk tales is non-existent. However, as soon as I finished this book I went on a research spree and now I need more novels inspired by Indian myths and tales. Anyway, the world crafted by Mandanna is fascinating! Indian mythology and Gods are perfectly intertwined with floating kingdoms and spaceships. The settings burst with life, making almost seem that you are crossing this universe dusted with celestial magic and colourful nebulae. Thank you to Edelweiss+ and the publisher for providing me with a review copy in exchange for an honest review. Have you read A Spark of White Fire? What did you think of it? Do you love space operas? Thank you. :) I love when authors make sure every character plays a part in the story and isn't only there for the sake of being. I hope you love A Spark of White Fire as much as I did. Wow wow wow I need to read this like, yesterday! You absolutely sold me at "there wasn't the dichotomy good/bad side", but just the whole space opera thing has intrigued me, I love those! And Esmae sounds FABULOUS, so yeah, I definitely need to read it ASAP. Wonderful review, so glad this was so great for you! Thank you. :) I hope you find an opportunity to read this book ASAP because it's so freaking amazing! Everything is perfection, from the settings to Esmae. oooh I remember this one now! I'm so glad the Indian mythology really worked for you. India in space is a neat concept that I don't think I've read before even though I love seeking out Indian myth books! The cover was a little general to me so I'm glad that wasn't due to the quality of the book! Great review, added! Now that you mention, I don't think I've read before Indian mythology in space. But it's such an amazing concept. :) This might sound foolish and petty, but, to me, the cover is one of the most important things in a novel. I confess that every time I see a cover with a bad design, I'm always suspicious of the content of the book.